The total proposed budget for Uasin Gishu County is increasing from Ksh. 7.4 billion in FY 2017/2018 to Ksh. 9.0 billion in FY 2018/2019. If the draft budget estimates for FY 2018/2019 are enacted without any amendments, 10 departments/sectors will received budget cuts with Health Services taking the lead with a Ksh. 1.8 billion in cuts. The money released from the above budget cuts will be going into three sectors or departments. The Public Service Management which will be receiving an additional Ksh. 2.9 billion to what the sector received in FY 2017/2018. The Finance department will get an additional Ksh. 542.4 million and Water, Environment, Natural Resources, Tourism and Wildlife Management will boost its budget by Ksh. 137.6 Million over their FY 2017/2018 budgets. That notwithstanding, there is no narrative in the Programme Based Budget (PBB) to explain these choices made. During the first half-year of Financial Year 2017/2018, Uasin Gishu spent a total of Ksh. 393.3 million on healthcare services. This is 90.9% of the county’s proposed budget for Fiscal Year 2018/2019. Uasin Gishu is planning for a budget of Ksh. 9 billion for FY 2018/2019 which will commence next week Monday. The revenues to support this budget will be generated from local revenue (Ksh.1.2 billion); Equitable Share of Revenue (Ksh. 5.9 billion) and Conditional allocations (Ksh. 1.9 billion) among others. The Uasin Gishu County Integrated Development Plan (2018-2022) points out the great benefits brought about to the health sector by the devolved form of government. First, during the first phase of devolution, the County spent funds on upgrading of six (6) Sub-County hospital into Level 4 hospitals. These hospitals are: Turbo, Burnt Forest, Ziwa, Moiben, Kesses and Kapteldon. These facilities are currently serving the county residents as referral centers. The Level 4 hospitals have higher standards to observe and hence they are expected to provide superior services compared to health centers and dispensaries. For instance, a level 4 healthcare facility should have at least one fully equipped ambulance standby 24 hours a day with at least 1 trained personnel other than the driver who shall also be trained on First Aid. Higher level classifications comes with a cost. This is a story for another day. Secondly, Uasin Gishu County constructed and equipped an Eye Hospital at Huruma courtesy of devolution. To ease transportation of patients to these health facilities, the County procured 13 modern ambulances to serve the high volume healthcare centers in the county. Finally, a total of 400 healthcare workers of various cadres were recruited and redeployed to various facilities to serve the residents. 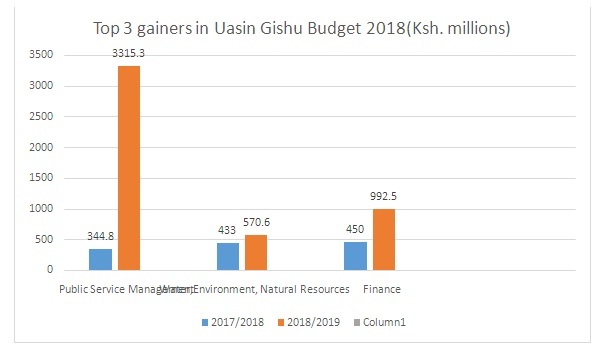 Our analysis of Uasin Gishu budget for FY 2018/2019 on comparison with the budget for FY 2017/2018 reveals that there are three main gainers from the budgetary allocations. If the budget is passed without any amendments, Public Service Management (PSM) will be the leading gainer with a Ksh. 2.9 billion increase in its budget over what the sector received in FY 2017/2018. Finance Department takes number two with a Ksh. 542.4 million increase and to crown off the top three list is Water, Environment, Natural Resources and Tourism which will be receiving Ksh. 137.6 million in additional funds. Health Services department is the biggest casualty since it stands to shed off Ksh. 1.3 billion from its FY 2017/2018 budget. In our own opinion, the health sector is no longer a priority in Uasin Gishu County. We know from experience that the state does not cut budgets of sectors which are on the top of their priority list. Universal Healthcare Coverage (UHC) is one of the Big Four Agenda, but from the planned allocation towards Health Services department, it is clear that we are retrogressing. We cannot achieve UHC by cutting budget for this key sector. 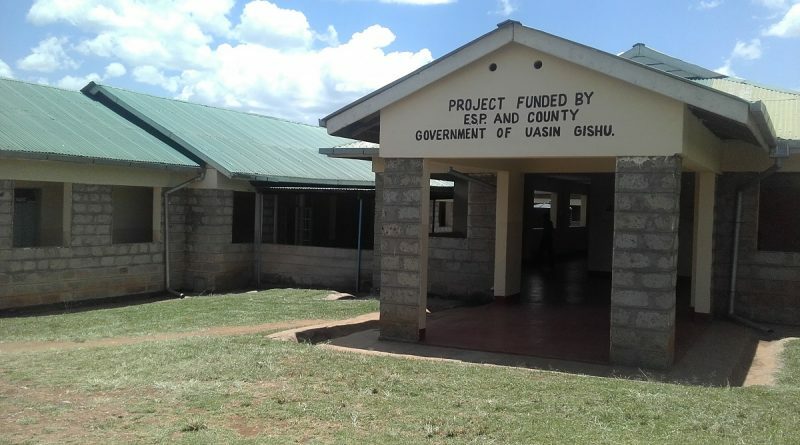 The reduced budget puts the 115 public healthcare facilities in Uasin Gishu in danger of missing requisite drugs, equipping of local health facilities, expansion and completion of ongoing projects. Uasin Gishu County needs to go back to the drawing board to reconsider the budgetary allocation towards Health Services. If there are very good reasons as to why the budget for health is receiving a cut then the residents should at least be informed in the narratives section of the Programme Based Budget for 2018/2019. There is more evidence in the Uasin Gishu County Fiscal Strategy Paper 2017 to the effect that the health sector needs more resources and not less. To be exact the Health Services Department require Ksh. 2 billion to continue providing services to the county residents. When did this resource requirement change to Ksh. 432.2 million? The budgetary allocation towards Health Services as a percentage of the total county budget is reducing from 23.8% FY 2017/2018 to 4.8% of the budget for FY 2018/2019. This is a huge decline without adequate explanation. It’s a mission impossible to pay the healthcare staff, maintain medical equipment, purchase and distribute medical supplies and provide vaccination among other services for a whole year using the meagre budget of Ksh. 432.2 million. This is actually what the sector will spend in half a year as we will see in a moment. According to budget Implementation reports from the Office of the Controller of Budget, during the first half-year of Financial Year 2017/2018, Uasin Gishu spent a total of Ksh. 393.3 million on healthcare services. This is 90.9% of the county’s proposed budget for Fiscal Year 2018/2019. It’s now clear that the proposed budget is inadequate for a full year of expenditure in delivery of healthcare services to the esteemed residents. 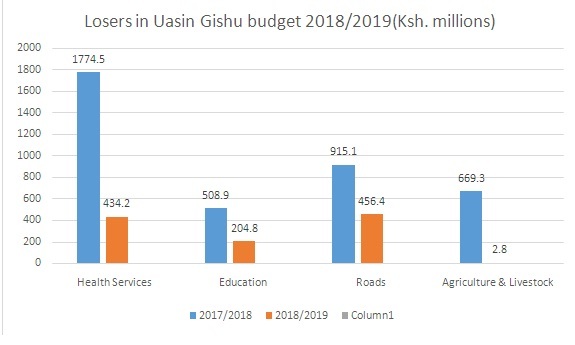 Compared to many counties in Kenya, Uasin Gishu performs well in terms of local revenue collection despite the fact that the county has never reached its targets for the year. The problem may be that the Uasin Gishu County sets overambitious targets. For instance, in FY 2015/2016, Uasin Gishu collected Ksh. 719.04 million out of the target of Ksh. 1.04 billion. During the year under focus, court fines performed extraordinary well by contributing 19.1 million out of the Ksh. 15 million target. However, this was not the largest source of local revenue collected. An item called Unclassified –Direct Banking (whatever that means) led the way by contributing Ksh. 173.7 million followed by Single Business Permits which contributed Ksh.150.5 million. We recommend that Uasin Gishu County increase the budget for health services from the proposed Ksh. 432 million to at least Ksh. 2 billion in order to provide all essential healthcare services in accordance with article 43 of the Constitution of Kenya. Revise the target for local revenue collection from 1.4 billion to Ksh. 1 billon since that is more realistic and considering that Uasin Gishu County has never hit the Ksh. 1 billion mark. 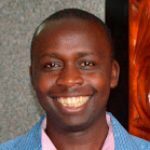 To promote more budget transparency Uasin Gishu should clearly indicate the revenue streams contributing the largest portion of local revenue which in the past was named Unclassified –Direct Banking. This will facilitate the work of County Assembly and the public in monitoring and evaluation of county programs.